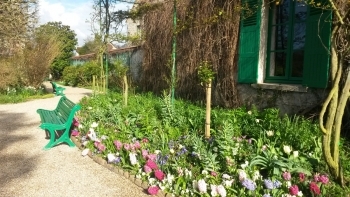 The name of Monet and his garden at Giverny evoke specific flowers: water lilies, wisterias, irises in large rows… It rarely brings up images of tulips. The big tulip show of April is a surprise to many visitors. Tulips in Monet’s times were not yet what they are now, but Monet planted them and painted them, especially on the dining-room doors of his art dealer Paul Durand-Ruel. They are so colorful and charming that a painter can only fall under their spell. 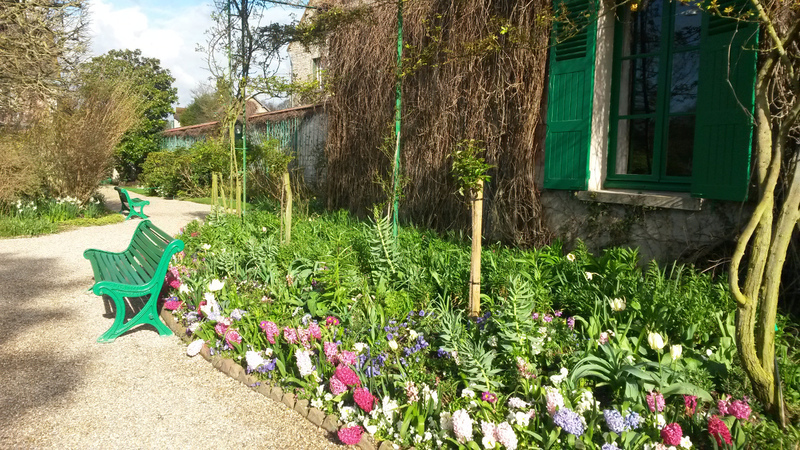 10 000 bulbs are planted yearly in Monet’s gardens at Giverny. During the first weeks after the opening, they pop out of the ground, form their thick buds and open all of a sudden at the first ray of sunshine. It is like a canvas suddenly covered by paint, each of them being a brushstroke. It may be the time of year when the feeling of walking in a painting is at its strongest in the flower garden designed by Claude Monet. The blooming of hyacinths is the sign that Spring has arrived at last. In Monet’s garden they are planted by hundreds. They are beautiful for their colors ranging from white to pale yellow, pink, purple, blue and even almost black, but to tell the truth it is their scent that makes them irresistible. If we humans would wear that much perfume, it would be a nuisance for people next to us. However, for flowers, rules are different. The more fragrance the better. We love walking or sitting in an air that is full of their delicious smell. Spontaneously we close the eyes to concentrate better on this experience. Colors forgotten, it is a treat to be nostrils only, taking in the best of springtime.